We’re partnering with a Canadian rooster, er roaster, to provide our friends north of the border delicious Haitian coffee. We carefully roast — so beans don’t get too dark & lose flavor (dark shiny beans are great for photos, not for drinking). 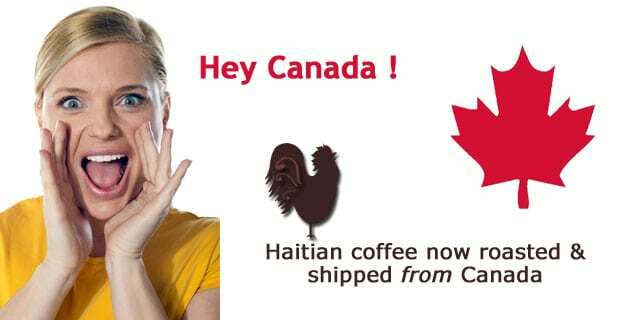 Canadians can now enjoy a daily cup of Haitian coffee without expensive shipping costs. Tasting notes : Deep, smoky-taste with hints of attractive bittersweet flavors. Creamy dark, rich & smooth. Our retail options launch soon but our wholesale is up & running. Tell your favorite Canadian nonprofit to use Haitian coffee & chocolate at their next fundraiser. They win, small producers in Haiti win.